YOU SHOULD TRY THESE PORK RIND NACHOS IF YOU WANT TO ADD SOME CRUNCH TO YOUR DAY WITHOUT ALL THE CARBS. Break out the smokey flavoured BAKEN-ETS (CHICHARRONES) because there is a way to make low-carb nachos and boy are they delicious. Keto nachos to the rescue any time you have a craving for something salty and crunchy. 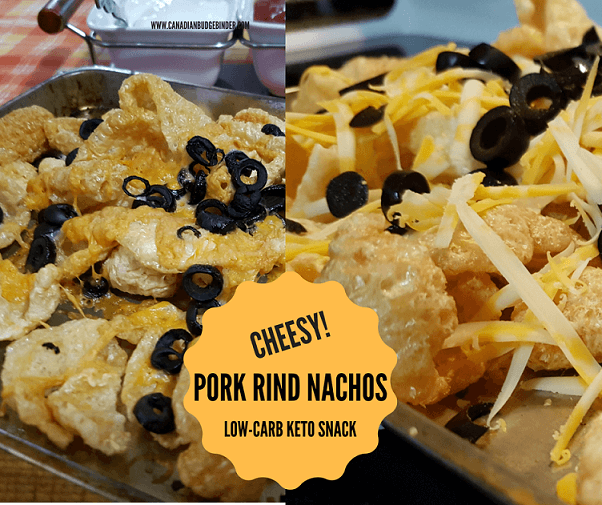 Pork rinds are the keto chips of the low-carb world and today I’ll show you how to transform them into loaded cheesy pork rind nachos. A ketogenic diet (keto) is a very low-carb diet, which turns the body into a fat-burning machine. It has many potential benefits for weight loss, health and performance, but also some potential initial side effects. A ketogenic diet is similar to other strict low-carb diets, like the Atkins diet or LCHF (low carb, high fat). These diets often end up being ketogenic more or less by accident. The main difference between strict LCHF and keto is that protein is restricted in the latter. Get ready folks it’s party food time but this round is for the low-carb foodies who want to tuck into the snack table with options. Low-carb keto snacks are perfect for those of you who are hoping to lower the amount of carbohydrates in your diet. The hard part is creating recipes that satisfy without missing the carb-loaded original version. When you begin a low-carb lifestyle most often you limit or give up foods that contain high amounts of carbs such as potatoes, pasta, rice and even nacho chips. When eaten in excess for some people this may cause them to gain weight since we don’t all process foods the same. It’s Not your time… Pork Rind Nacho time! I love nachos especially those little scoops that you can dig in and load up with toppings. You’d have to pull me away from the bag if I was really hungry. While we were away visiting relatives recently they decided to have a loaded nacho dish hot from the oven with all the fixings. There were about 15 hungry people to feed including Mrs. CBB although she won’t eat regular nacho chips. The difficult part about enjoying a low-carb, Ketogenic or Paleo diet is that you give up the stuff that you have come to love over the years. What’s interesting is when you stop eating foods that are high in carbs and replacing them with alternatives you don’t really miss them at all. One of the hardest things for Mrs. CBB to give up was milk chocolate. Dark chocolate was never part of her private stash at all because she despised it. Since being on a low-carb diet pass her an 85% Lindt bar and she’ll love it and kiss it forever. She adores dark chocolate now especially how the flavour just pops in her mouth. My point is once we get rid of that taste that we crave and replace it with alternatives we tend to forget about the naughty stuff. Mrs. CBB didn’t want to be left out of the party food so she went shopping with her cousin to pick up the bits to make loaded cheesy low-carb nachos. Although it may seem odd that someone would make nachos with pork rinds they are actually pretty good. Pork rinds or fried pork skins are also known as chicharonnes, pork skins, pork scratchings or pork cracklins. You can find bags of pork rinds at almost every grocery store for about 1.99 a bag. We’ve also found them at the Bulk Barn for just over two dollars a bag. They offer flavoured garlic pork rinds too but we didn’t think much to them. The interesting part is that you won’t eat many pork rind nachos before you’re satisfied compared to a full plate of regular nachos. << I could polish off a plate of nachos myself. Just about everyone in the room had a look at the pork rind nachos and gave them a try. It’s nice to see people try something new especially when they don’t have to. The results from the non-low-carb foodies was that they pork rind nachos were A-ok. What a relief. Since it’s the Victoria Day long weekend in Ontario otherwise known as May-24 party food is part of the party. 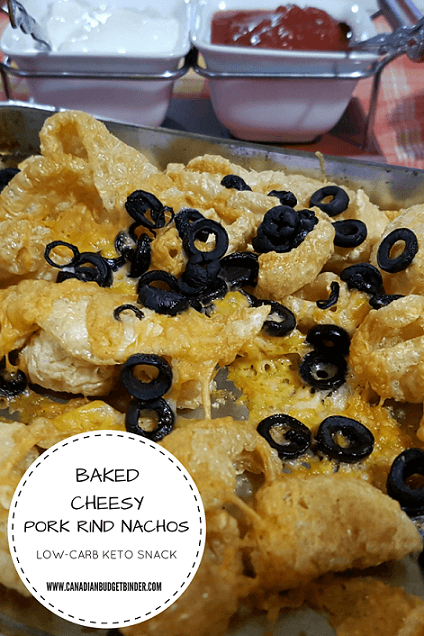 If you’re hosting a party or even attending a party and only eat low-carb foods consider bringing pork rind nachos which are easy to put together and bake in the oven. 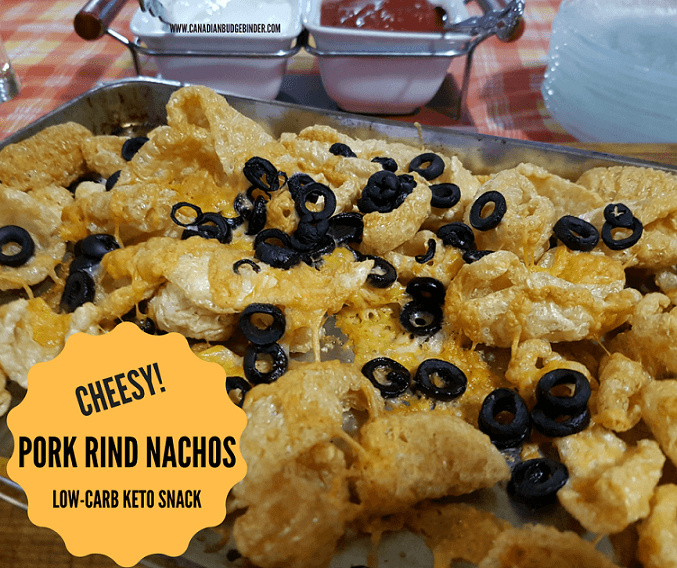 Let’s make some low-carb cheesy pork rind nachos! These are so simple to make and easy to eat! Just because you eat a low-carb keto diet doesn't mean that you can't enjoy all the pleasures in life. These baked cheesy low-carb nachos are easy to make and easy to eat. Enjoy. Minced beef, pulled pork, turkey mince, chicken mince etc. On a baking sheet or small baking pan dump your bag of pork skins. Top with shredded cheese, black olives and any other toppings you'd like to have baked on top of the nachos. I kept it simple. Bake for 10 minutes in a 350 degree oven or until the cheese is melted and serve with sides. Sides- sour cream, salsa, jalapenos, hot sauces etc. Another great dip for these low-carb nachos would be my low-carb Creamy Avocado Blue Cheese Dressing. The flavours will have a party in your mouth. This is based on the bag of Baken-Ets without any toppings. Depending on what you add the nutritional values will change. 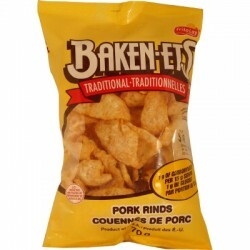 9 pork rinds 15 g, 90 calories: Net Carbs -1g, Fat 6g, Protein 7g, *Using Atkins Carb Counter /Total Carbs 1g or 1g per serving.